Despite the development of a national strategy in the mid-1990s to tackle the significant rise in homelessness, best estimates suggest that the number of homeless has not actually been reduced. This report examines Canada’s national homelessness program since its launch and makes the case for fully implementing a “Housing First” approach. In response to a significant rise in homelessness in the mid-1990s, particularly in Canada’s larger cities, the federal government developed a national program, based on community partnerships, largely to address the underfunding and insufficient supply of beds in shelters for homeless people. Since the program’s announcement in late 1999, it has allocated more than $1 billion on direct homelessness programming. Although the community-based model underlying the federal program has been fairly well received, best estimates suggest that the number of homeless people has not been reduced. A number of other issues have emerged, including: the lack of reliable data on the actual number of homeless people in Canada; no clear commitment to the Housing First principle, which focuses on getting homeless people into housing, with additional supports so they can maintain their new housing; and divided responsibility for matters related to homelessness within the federal government. Provincial governments are the most important constitutional levers related to the homeless population, and a number of them have been addressing the issue for quite some time. In the past several years, some of them—Alberta and New Brunswick are leading examples—have expanded their programming. In some cases, community innovations have had an impact on the shape of provincial programs. However, the Housing First principle has not been widely implemented. Moreover, with a few exceptions, provincial governments have not taken steps to actively coordinate their efforts across different departments with responsibilities that could help reduce the number of people who remain homeless. 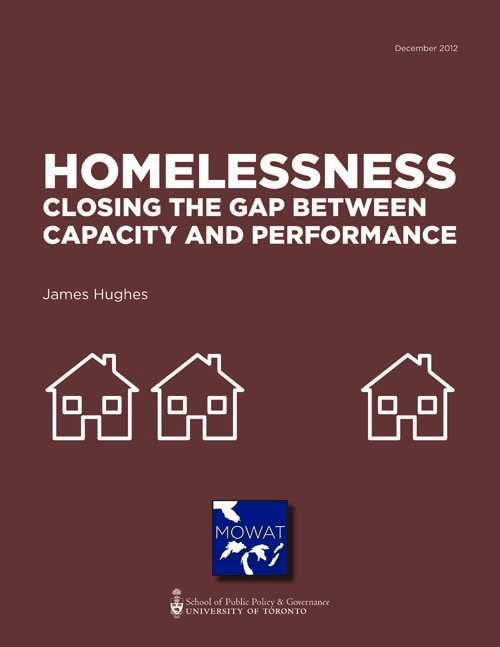 Drawing on interviews conducted with representatives of the federal and provincial governments, non-profit organizations, and the academic sector, the author uses examples of innovative practice to demonstrate that there is a great deal of capacity in the homelessness sector in Canada but that this capacity is not being translated into sufficiently positive results. Part of the problem lies in the overlapping and competing roles of the different orders of government, a lack of clarity about who does (or should) do what, and a lack of incentives to squarely address the core problem. There are nonetheless promising practices to build on. In some communities, such as Trois-Rivières (Quebec), innovative and effective programs have been developed to help move homeless people out of homelessness. To help build on this untapped capacity, the author recommends that the federal government’s involvement be transformed. In interested provinces, the provincial government would be solely responsible for direct homelessness programming. This would be reflected in bilateral agreements between the federal and relevant provincial governments; each agreement would stipulate the terms for continuing funding from the federal government. The federal government should fund housing projects for homeless people who can leave shelters through a Housing First Fund and play a leading role (through Statistics Canada) in data collation and analysis. In addition, provincial governments should implement a series of priority actions, including: rules for shelter funding that place an incentive on the reduction of homelessness; shelter bed moratoria; coherent and coordinated discharge planning; and the appointment of a minister responsible for homelessness, where this is not already the case. Above all, these and other actions need to be coordinated through a more integrated, client-centred approach to addressing the challenges in this important policy field, particularly the causes of homelessness.